Prolapse of the vaginal apex can be treated using multiple surgical modalities. We describe national trends and patient characteristics associated with the surgical approach and compare perioperative outcomes of abdominal versus vaginal repair of apical pelvic organ prolapse (POP). The 2006–2012 National Surgical Quality Improvement Program Database was queried for abdominal sacrocolpopexy (ASC) and vaginal apical suspensions. Patients were stratified by whether or not concomitant hysterectomy (CH) was performed or whether or not they were post-hysterectomy (PH). Multivariate logistic regressions were adjusted for confounding variables. A total of 6,147 patients underwent apical POP repair: 33.9% (2,085) ASCs, 66.1% (4,062) vaginal suspensions. 60.0% (3,689) underwent CH. In all cohorts, older patients were less likely to have ASC (CH: OR 0.48, CI 0.28–0.83, p = 0.008 for age ≥ 60; PH: OR 0.28, CI 0.18–0.43, p < 0.001). Over time, the proportion of all vaginal and abdominal repairs remained relatively stable. Use of minimally invasive ASC, however, increased over the study period (trend p < 0.001), and use of mesh for vaginal suspensions decreased (p < 0.001). ASC had a longer median operative time (PH 174 vs 95 min, p < 0.001; CH 192 vs 127 min, p < 0.001). Complication rates were the same for vaginal repairs and ASC, overall and when sub-stratified by hysterectomy status. Nationally, most apical POP repairs are performed via a vaginal route. Older age was predictive of the vaginal route for both CH and PH groups. ASCs had longer operative times. 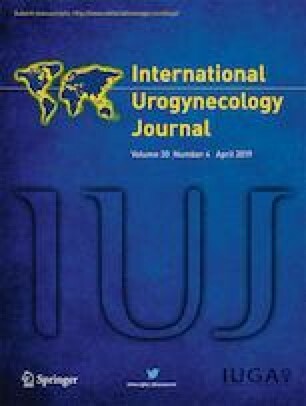 There has been increased utilization of minimally invasive ASC and decreased use of mesh-augmented vaginal suspensions over time. We received no financial funding for this study. Dr Adonis K. Hijaz is a member of the Astellas, Inc. Speaker’s Bureau. The remaining authors declare that they have no conflicts of interest. Ortman JM Velkoff VA, Hogan H. An aging nation: the older population in the United States. 2014. Available at https://www.census.gov/prod/2014pubs/p25-1140.pdf. Accessed 6 Feb 2018. Maher C, Feiner B, Baessler K, Schmid C (2013) Surgical management of pelvic organ prolapse in women. Cochrane Database Syst Rev. (4):CD004014. https://doi.org/10.1002/14651858.CD004014.pub5. American College of Surgeons: About ACS NSQIP. (2016) Available at https://www.facs.org/quality-programs/acs-nsqip/about. Accessed 28 April 2016. PUF Data Dictionary Items | National Cancer Data Base - Data Dictionary PUF 2013. Available at http://ncdbpuf.facs.org/node/259. Accessed 25 April 2016.